Jeff Preiss was inspired by the diary films of Jonas Mekas and Warren Sonbert (who was his teacher at Bard College). He began in the early 1980s making silent, semi-narrative works born out of his practice of shooting with his Regular 8mm Bolex on a daily basis. Warren Sonbert’s WHERE DID OUR LOVE GO? has been digitally restored with funding by the Fondazione Prada Milano. This new digital restoration was screened at The New American Cinema Torino 1967 along with films by Robert Breer and Ben Van Meter. Gartenberg Media Enterprises is pleased to announce a retrospective of Warren Sonbert’s films, for the first time extensively paired together with those of Hollywood filmmakers of the postwar years, including Douglas Sirk, Alfred Hitchcock, Vincente Minnelli, Nicholas Ray, and Michael Gordon. Six programs will be screened at the Cinematheques in both Jerusalem and Tel Aviv. This series has been co-curated by Chen Sheinberg and Jon Gartenberg, and is presented by the Center for Contemporary Art in Tel Aviv, with the support of the Ostrovsky Family Fund. Before the first screenings (on February 14 and 15), Jon Gartenberg will give an introduction to Warren Sonbert’s work. Chen Sheinberg will introduce the screenings that follow in the coming months. [Note to reader: The Hebrew version begins from the top down, and the English version from the bottom up]. “Two years ago, OFF 4 series explored various facets of the interrelations and mutual influences between Hollywood and the cinematic experimental avant-garde from the 1920s to our own time in terms of cinematic expression, visual aesthetics and themes. Following the success of that series, and as I kept researching this theme, Vivian Ostrovsky called my attention to one of the seminal figures in American experimental filmmaking – Warren Sonbert. Having discussed it, we decided to focus this time on this specific filmmaker and examine his relationship to classic postwar Hollywood cinema. Ostrovsky referred me to Jon Gartenberg, a world expert on Sonbert’s cinema, who served for 18 years as a curator in the film archive of The Museum of Modern Art in New York and as the experimental film programmer for the Tribeca Film Festival, and has been working for years on archiving and preserving the cineaste’s work and curating retrospectives of his films in many major museums and cinematheques all over the world. Waren Sonbert's CARRIAGE TRADE will be playing as part of the Essential Cinema Repertory program at Anthology Film Archives. It will be screening one night only on Friday, February 3rd at 8:30pm. Warren Sonbert’s CARRIAGE TRADE was screened at the Cineteca Bologna along with Peter Hutton's IMAGES OF ASIAN MUSIC. Gartenberg Media Enterprises is proud to announce Warren Sonbert screenings to take place at the 2016 Glasgow International, a biennial festival of contemporary art. HALL OF MIRRORS (1966) will be shown together with his silent film DIVIDED LOYALTIES (1978) that will be accompanied by a live score, performed by Luke Fowler and Richard McMaster. The event will take place April 23. "In a special 16mm screening Luke Fowler and Richard McMaster will be performing a live mix in quadrophonic sound to score Warren Sonbert’s silent film Divided Loyalties. This performance of an original sound composition to accompany Sonbert’s silent film is made possible with the special permission of The Estate of Warren Sonbert. The performance will be accompanied by a screening of the Sonbert short Hall of Mirrors with its original sound. Sonbert built upon his early experiments in camera movement, lighting, and framing to create brilliantly edited masterworks that encompass not only his New York milieu, but also the larger sphere of human activity. In these films he commented upon such contemporary issues as art and industry, news reportage and its effect on our lives, and the interrelationship between the creative arts. His late works culminated in symphonic montages (both silent and sound) that unite universal human gestures into singular works of moving image artistry." Gartenberg Media Enterprises is proud to announce the program lineup for the Warren Sonbert Retrospective taking place at The Wexner Center for the Arts in Columbus, Ohio on January 20th & 27th. "One of the most original and influential figures in American experimental cinema, Warren Sonbert began making films in 1966 as a precocious NYU student who found himself in the midst of Andy Warhol’s Factory. After graduating, he took his Bolex camera on his travels as he perfected a complex style of filming and editing that lyrically transforms mundane-yet-beautiful details into larger emotions, concepts, and visual splendors. Sonbert’s influences ranged from rock-and-roll to opera, from Douglas Sirk to Stan Brakhage. This vital retrospective featuring all newly restored prints cements his reputation as one of the most innovative and notable experimental filmmakers of the last half of the 20th century. As a testament to his ongoing vitality, the spring 2015 issue of Framework: The Journal of Cinema and Media is devoted to Sonbert’s writing. Pick up your copy at the Wexner Center Store." "Following the filmmaker’s death in 1995 of AIDS, Sonbert’s partner, Ascension Serrano, tasked Jon Gartenberg, through the Estate Project for Artists with AIDS, with the preservation of Sonbert’s work. Gartenberg first became associated with Sonbert’s films while Gartenberg was a curator at the Museum of Modern Art, during which time he acquired several of Sonbert’s films. '[Sonbert's] idea was to engage the viewer in an accumulation of different shots that were not specifically narrative, but that were linear and poetic,' Gartenberg said. 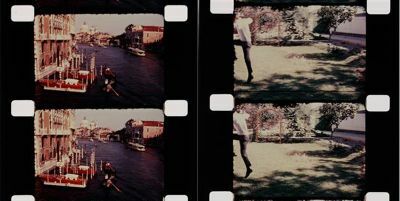 'But more than any experimental filmmaker, his work was less about image abstraction and more about an experimental approach to narrative structure, through how he built a montage of images and scenes.'" Framework issue 56.1 devoted entirely to Warren Sonbert was featured in Canyon Cinema's latest newsletter. Canyon Cinema has 16mm prints of Sonbert's work, available for rental. Yesterday, Jon Gartenberg was invited as a guest lecturer in Lynne Sach's NYU film production class on the cinematic oeuvre of Warren Sonbert. Below is an image of Jon with Lynne towards the end of the lecture. 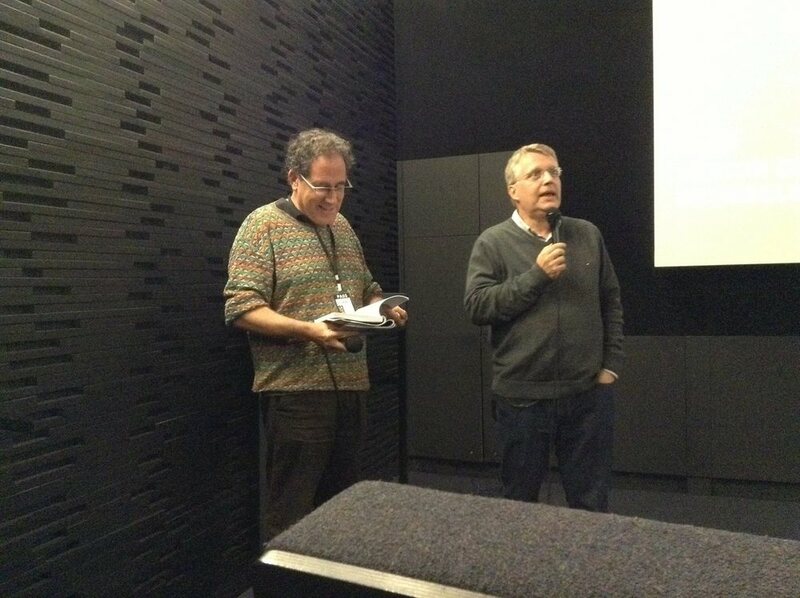 Jon Gartenberg presenting with Nicola Mazzanti (director of the Royal Belgian Film Archive) on the first night of the Warren Sonbert retrospective as part of the L'Age d'Or Film Festival in Brussels. Below is also an image of Warren Sonbert's film WHIPLASH on the monitor of the festival theater's lobby. Shot of WHIPLASH on TV monitor.